The Bishop of Lira Diocese Rt. Rev. Sanctus Lino Wanok has advised against the choice of leaders who survive because of their divide and rule policy saying, the biggest problem most society are faced with is due to leaders who do not work for justice and peace. The Bishop who was this week speaking at Nazareth Family Center Barogole during the evaluation meeting of the 14th edition of the Provincial Prayer and Peace Week that was celebrated last January in Lira, said the problem of good leadership is the reason why the Church has been manipulated on issues of their foundation schools and other property. He said this can be corrected once the people learned the importance of choosing the right leaders without any influence. “In Genesis Chapter 25: 29-34 Esau swore to Jacob and sold him the birthright. 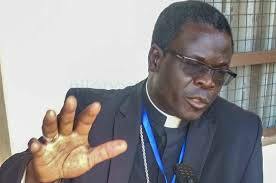 This teaches us that because we elect leaders due to what we need for our stomach, we end up with leaders who divide and rule” said Bishop Wanok. “Let us not treat the symptoms we can see. Lets go deeper. And this is what leadership means. You have enough power to cause change of leadership in the Church, district and at home”, the Bishop implored his the congregation that included the officials and members of Justice and Peace Commission of Lira Diocese, the Clergy, Religious Sisters and the Laity most of whom participated in organizing the Prayer and Peace event at Lango College.